1 Office of International Students and Scholars Wayne State University LAWFUL PERMANENT RESIDENCY A Lawful Permanent Resident (LPR) is a person who has been lawfully accorded the privilege of residing in the United States as an immigrant. An individual who is lawfully admitted to the United States as an immigrant is commonly referred to by different terms, including: immigrant, permanent resident, lawful permanent resident, and green card holder. An individual can become a lawful permanent resident through a variety of avenues. There are three principal bases for qualifying for lawful permanent residence: Family: This category requires a close family who is a citizen or lawful permanent resident to petition on behalf of the alien member. Employment-based: This category relates to the kind of work that the non-immigrant will be engaged in, and often (though not always)* require a U.S. employer petition on behalf of the non-immigrant. Public or humanitarian policy: This category has been developed to meet the needs of refugees as well as public goals such as diversity. 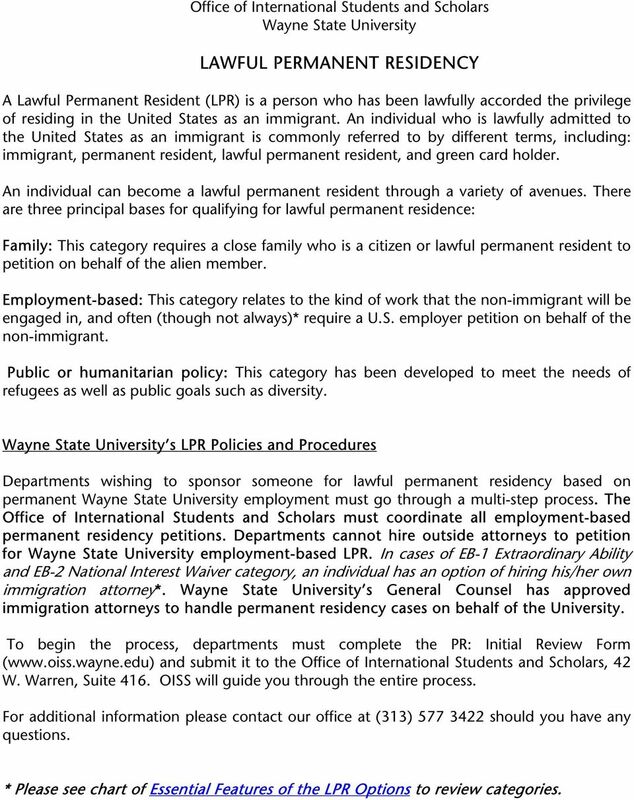 Wayne State University s LPR Policies and Procedures Departments wishing to sponsor someone for lawful permanent residency based on permanent Wayne State University employment must go through a multi-step process. The Office of International Students and Scholars must coordinate all employment-based permanent residency petitions. 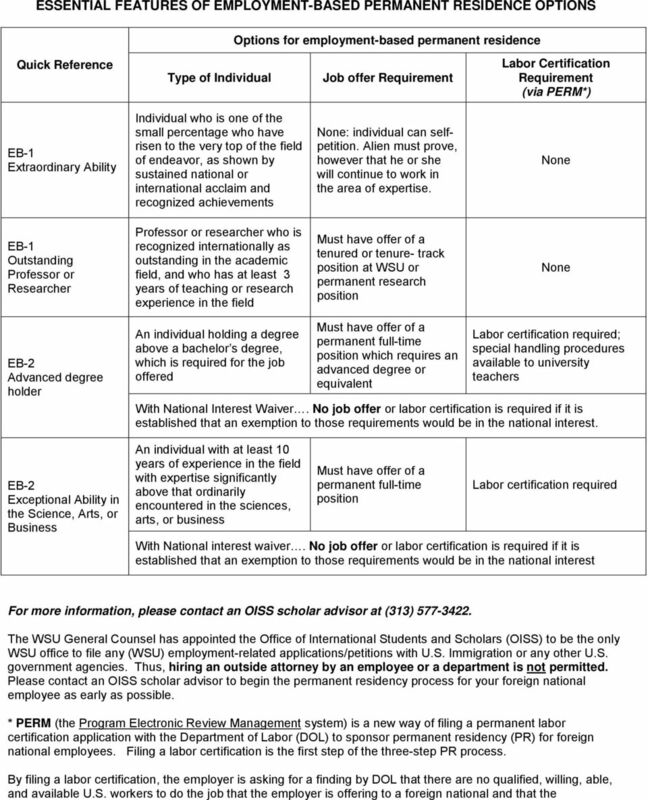 Departments cannot hire outside attorneys to petition for Wayne State University employment-based LPR. In cases of EB-1 Extraordinary Ability and EB-2 National Interest Waiver category, an individual has an option of hiring his/her own immigration attorney*. Wayne State University s General Counsel has approved immigration attorneys to handle permanent residency cases on behalf of the University. To begin the process, departments must complete the PR: Initial Review Form ( and submit it to the Office of International Students and Scholars, 42 W. Warren, Suite 416. OISS will guide you through the entire process. For additional information please contact our office at (313) should you have any questions. * Please see chart of Essential Features of the LPR Options to review categories. 3 employment of an alien will not adversely affect the wages and working conditions of similarly employed U.S. workers. All labor certifications filed with DOL on or after March 28, 2005 must be filed (by the employer) meeting the PERM recruitment requirements. PERM has two tracks: Faculty Special Handling option for university teachers; and standard option for non-teaching faculty and professionals. Filing a PERM application is a very complicated and complex process, thus please consult with OISS for each individual case as rules and regulations change often. In addition, individual efforts by an employee or department might not meet the PERM requirement. Then, all previous recruiting efforts have been wasted and might not be used for the filing under PERM. Thus, please consult with an OISS scholar advisor in advance. 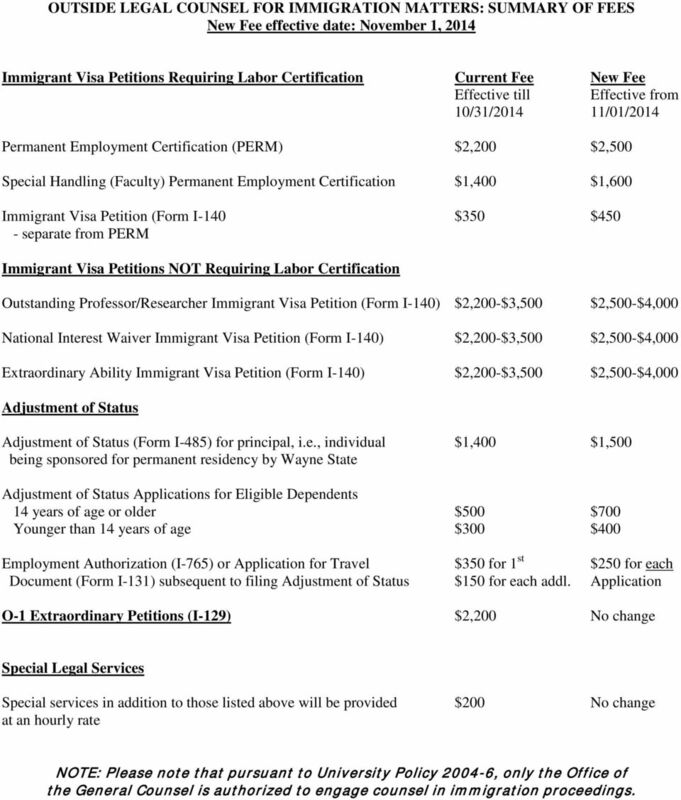 6 OUTSIDE LEGAL COUNSEL FOR IMMIGRATION MATTERS: SUMMARY OF FEES New Fee effective date: November 1, 2014 Immigrant Visa Petitions Requiring Labor Certification Current Fee New Fee Effective till Effective from 10/31/ /01/2014 Permanent Employment Certification (PERM) $2,200 $2,500 Special Handling (Faculty) Permanent Employment Certification $1,400 $1,600 Immigrant Visa Petition (Form I-140 $350 $450 - separate from PERM Immigrant Visa Petitions NOT Requiring Labor Certification Outstanding Professor/Researcher Immigrant Visa Petition (Form I-140) $2,200-$3,500 $2,500-$4,000 National Interest Waiver Immigrant Visa Petition (Form I-140) $2,200-$3,500 $2,500-$4,000 Extraordinary Ability Immigrant Visa Petition (Form I-140) $2,200-$3,500 $2,500-$4,000 Adjustment of Status Adjustment of Status (Form I-485) for principal, i.e., individual $1,400 $1,500 being sponsored for permanent residency by Wayne State Adjustment of Status Applications for Eligible Dependents 14 years of age or older $500 $700 Younger than 14 years of age $300 $400 Employment Authorization (I-765) or Application for Travel $350 for 1 st $250 for each Document (Form I-131) subsequent to filing Adjustment of Status $150 for each addl. Application O-1 Extraordinary Petitions (I-129) $2,200 No change Special Legal Services Special services in addition to those listed above will be provided $200 No change at an hourly rate NOTE: Please note that pursuant to University Policy , only the Office of the General Counsel is authorized to engage counsel in immigration proceedings. 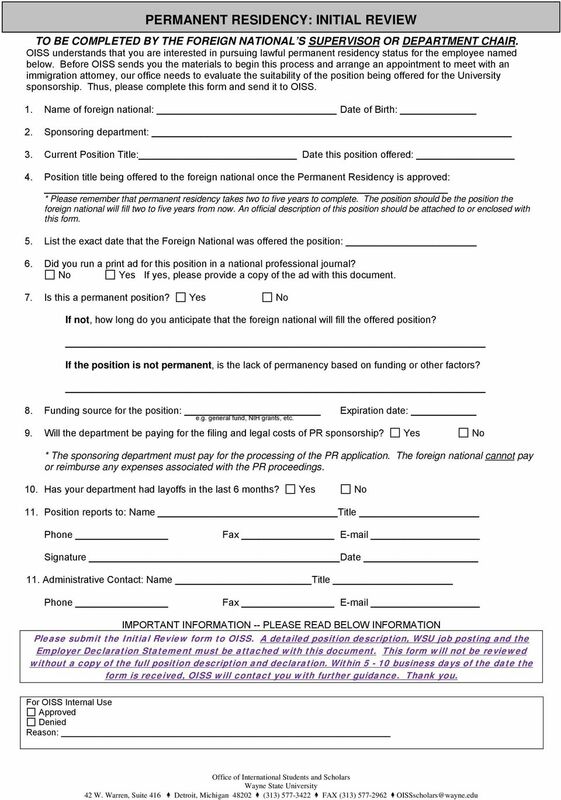 A Quick Guide and Checklist for Hiring International Faculty This guide is designed to provide an overview of the immigration process for new international faculty and will be applicable in most cases.